The Yankees took the diamond Friday night looking to extend their four-game win streak with a victory over the Rangers. The first game of this series saw the Yankees hit five home runs en route to a 7-3 win. Tonight, the bats came alive late, but the Yankees arms did not do enough to keep them in it as they fell 12-7 to the Rangers. 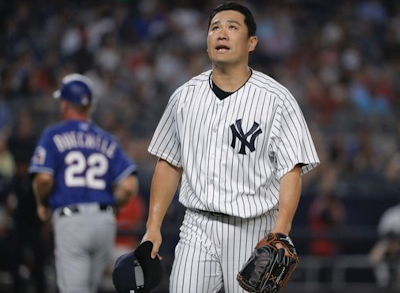 Tanaka started out solidly, allowing just two baserunners through the first three innings. In the top of the fourth, he ran into trouble. On the second pitch of the inning Elvis Andrus lined a single to right. Just two pitches later, Adrian Beltre launched a home run over the right field wall that only went about five rows back. Nonetheless, a 2-0 lead for Texas. Ronald Guzman tacked on a solo blast later in the inning. The fifth inning wasn’t to much better for Tanaka. Back to back leadoff walks followed by a fielder’s choice had Rangers on the corners with just one out. Elvis Andrus put his second hit on the board with a double down the right field line, which plated both runners. Boone let Tanaka finish it out as he retired the next two batters in order. Rangers starter Mike Minor had the Yankees number tonight. Through the first four innings Minor had only thrown 50 pitches, allowing just two hits. In the fifth, Brett Gardner took him out to right center, but he remained relatively unscathed. The top of the sixth got sloppy for the Bombers. Tanaka came back out to start the inning but was pulled after one batter: a solo shot for Ronald Guzman (2ndof the game). AJ Cole came on in relief, but he, like Tanaka, just didn’t have it. He retired the first two batters he faced, but a two out walk started a rally for the Rangers. A Shin-Soo Choo double followed by a Rougned Odor single (reached second via an error) had the Rangers up 8-1. Another hit from Elvis Andrus plated the ninth run of the game. Cole got Adrian Beltre out to finally end the inning. The Yankees put together a threat of their own in the bottom half of the sixth. With two outs and two on, Miguel Andujar continued his hot hitting, smacking a ground rule double up and over the left field fence. Luke Voit followed this with his second hit in a Yankee uniform: a bloop single to center. This plated two and cut the deficit to five. Clearly Aaron Boone thought this five-run lead was insurmountable because he sent AJ Cole back out for the seventh. He gave up Ronald Guzman’s third solo shot of the night, making him the first rookie to hit three home runs in a single game against the Yanks. Chad Green came in to pitch the eighth, and like the previous two Yankee arms, he struggled. Back to back singles followed by an Adrian Beltre double gave the Rangers a 12-5 lead, putting any hope the Yankees had out of reach. 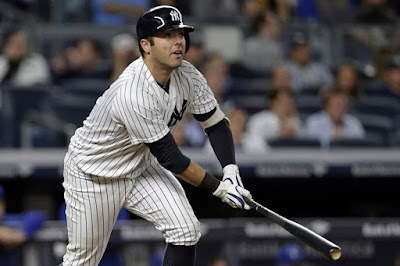 Austin Romine led off the top of the seventh with a home run, and continued his hot hitting with a two run single in the eighth. Romine finished the night with three knocks and three RBI. Neither team added any runs to the board in the ninth as the Yankees lost game two of this four game set 12-7. WP: Mike Minor: 5.2 IP, 6 H, 4 ER, 2 K.
LP: Masahiro Tanaka: 5.0+ IP, 6 H, 6 ER, 3 BB, 2 K.
Austin Romine: 3-for-4, HR, 3 RBI. Didi Gregorius: 3-for-5, 2 R.
Elvis Andrus: 4-for-5, 2B, 3 RBI. Adrian Beltre: 2-for-5, 2B, HR, 4 RBI. Ronald Guzman: 3-for-5, 3 HR. Game three of this four game series will be Saturday afternoon, first pitch at 1:05 EST. Lance Lynn will take the ball for the Yanks, making his first start in pinstripes.